A native of Washington’s Tri-Cities area and a graduate of Central Washington University, McBride is helping the USGS design the ShakeAlert earthquake early-warning system. An emoji could be invaluable in crafting short, easy-to-understand alerts that arrive minutes to seconds before strong ground shaking begins, she said. Social media is already being used by scientists to almost instantaneously locate earthquakes around the globe, as people take to Twitter to report shaking and damage and casualties. An emoji could cut through language barriers and speed the flow of information, said Stephen Hicks, a postdoctoral researcher in seismology at the UK’s University of Southampton and a lead organizer for the #emojiquake project. “The faster we know an earthquake has happened, the better we can analyze its possible effects and send help in emergency situations,” he said. The project is also fun for the young researchers who cobbled it together a few weeks ago, Hicks said. Some of their older colleagues likely raised their eyebrows at the idea, he admitted. Many of the initial discussions took place on Twitter, where a lively network of quake scientists and aficionados follow each other and obsessively track major temblors. The goal of the competition is to attract ideas not just from scientists, but from people skilled in art and graphic design, McBride explained. An effective emoji has to be clear at a very tiny size, instantly recognizable across cultures and friendly to those with colorblindness. Of the more than 40 entries so far, some portray the Earth cracking like an egg. Others emphasize the human experience, with houses or people being rattled. At least one incorporates a seismograph tracing. The steering committee will winnow the field to four or five finalists. The winner will be selected by popular vote through Twitter. But simply designing a new emoji isn’t enough to get it accepted. That’s up to the Unicode Consortium, an international group that approves and standardizes the array of icons on cellphones, computers and social-media platforms around the world. The steering committee will work with the designer to gain Unicode approval, a process that requires an application and a written justification. “Anybody can do it, if you have an idea and you have a good case you can make for it,” said Seattle-area native Elizabeth Angell, a member of the #emojiquake steering committee and a doctoral candidate in anthropology at Columbia University. Angell, who graduated from the University of Washington, grew up with duck-and-cover drills at school. She remembers her grandparents’ stories about the 1949 Olympia earthquake, and at the age of 19 got a firsthand taste when the 2001 Nisqually earthquake shook her rented house in the U-district. Those experiences helped inspire her decision to specialize in the social, cultural and political aspects of earthquake disasters. 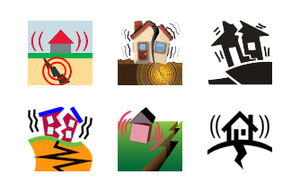 She’s eager to see how an earthquake emoji will fare and evolve in the online world. The “blue wave” emoji commonly used to signify tsunamis has gained a new life as a symbol for a possible wave of Democratic victories in the coming midterm elections, she pointed out. The deadline for entries is July 14. Guidelines and instructions are spelled out on the #emojiquake website. Sandi Doughton: 206-464-2491 or sdoughton@seattletimes.com; on Twitter: @SandiDoughton. Sandi Doughton is The Seattle Times' science reporter.